Candy floss is the kids favorite when we out to carnivals eh – adults too – including me…LOL. It’s light. It’s sugary. It’s delicious. It’s perfect. 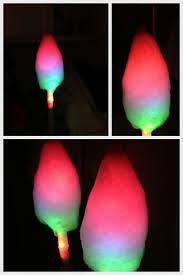 But if you think it can’t be improved upon, think again – because Disney has just started a colourful light-up cotton candy. Available at Disneyland’s World of Colours, the floss features pink, blue, green and purple swirls which sit on top of a flashing illuminated wand. And the result is a sugary, multicoloured cloud of neon light.